This is a simple, fast and good-looking Computer Repair Joomla Template for your future computer services website. It will allow you to start your business with a fully-functional website. 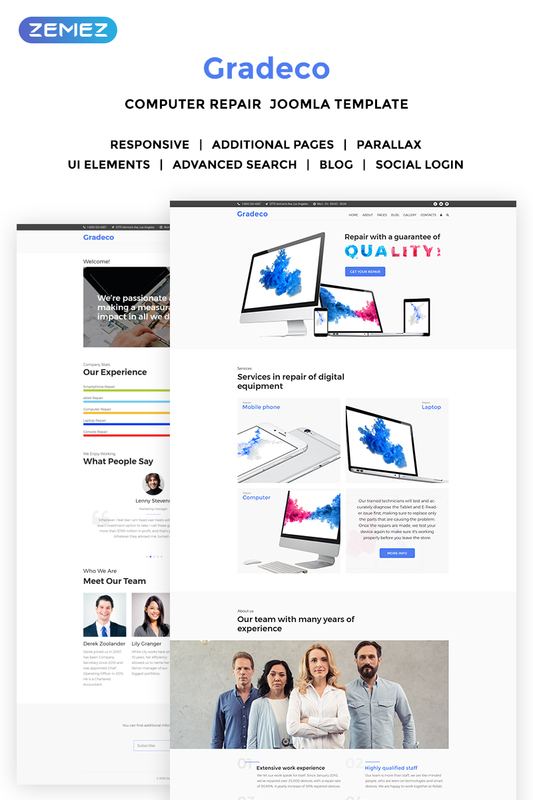 With this template, you'll get multiple pages with adjustable elements to make your future website look really unique. The clean design of multiple stunning page layouts will provide you with a premium solution for developing a cool Joomla website. With the Computer Repair Joomla Template, you can create any computer-related website. It has an amazing interface that will help you build effective navigation for your target customers. This Computer Repair Joomla Template will be the only template that youâ€™ll need to get the site that suits all your needs. Can I contact the Computers & Internet Company Joomla design theme author? After Joomla theme for Pc Service purchase you can put your copyright to the template. But you cannot place a line at the bottom (or any other spot) of the customized project saying "Website design by Company name". Nevertheless, you can place "Customized by Company name".